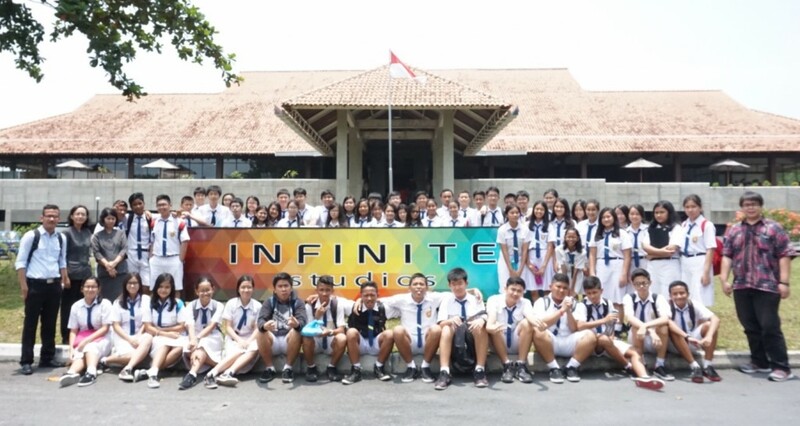 We were very happy to host the 9th grade and 7th grade students from a junior high school here in Batam. A grand total of slightly more than 100 students accompanied by their teachers and the principal of the school visited us over the two days period. They were welcomed by Ms. Rofiana (a member of the Animation Production team) and myself. The students were raring to go the moment they arrived to the studios, ready to explore and learn a lot about animation and live-shoot productions. Due to the large number of students that arrived on each day, they were divided into two. One group was to tour the animation work areas, being shown the production reels, and not forgetting a fruitful Q&A session with one of the animation supervisors. On the other hand, the other group joined me for a tour around the liveshoot areas, going through the production offices, both the sound stages, and of course the backlot area. Afterwards, the two groups swapped places. Right after the tour, the students were asked for one last time if they want to be animators or being involved in film production in future. The students, brimming with confidence, ecstatically replied a resounding “YES!” in unison. It was our pleasure to be able to get the marvellous opportunity to help garner genuine interest in the creative industry into these youths, on whose shoulders the overall future of Batam and Indonesia as a whole actually lies.